To really learn, to understand the whole concept and not just memorize a formula or scientific law, you have to get your hands on things and make stuff. Education experts call it kinesthetic learning. Scientists call it inquiry and experimentation. Hear it, see it, do it, teach it to another student, get it! On Saturday morning I attended the Emerald City Makers meetup, which was hosted at Student RND in Bellevue. Both groups are dedicated to helping people make stuff and share their knowledge and skills with others. “Student Research and Development (StudentRND) is a student-run non-profit organization that aims to inspire students to learn more about science and technology by offering hands-on opportunities for students to explore beyond and experiment with the concepts that were so laboriously covered in school textbooks,” it says on their web site. Both K-12 schools and colleges have limited budgets and time to lead students through experimentation, observation, and engineering projects. Adam Ryman gave us a tour of the facility. The Student RND lab is available for anyone to drop by, or you can come to a scheduled event. Adam demonstrated the Plasma Speakers, which play music through an arc that vibrates the air to make hot and dangerous musical notes! You can buy or build your own plasma speaker by donating to the Student RND Kickstarter project. 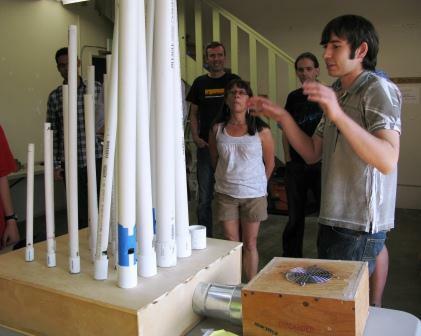 Adam also demonstrated a PVC Pipe Organ. The DIY Pipe Organ is loud and out of tune, but almost ready for playing Whiter Shade of Pale! Students aren’t the only ones who lack hands-on learning and understanding. “I’m a software guy, and I don’t know why my circuit isn’t working,” was a common statement made by mid-career adults at the Emerald City Makers meetup. We remember the formulas from high school physics, V=IR (voltage = current * resistance), and generally know how capacitors and diodes work. However, applying those formulas to troubleshooting a real circuit board in your hands gives you a completely different level of understanding. Patrick brought his little girl and his radio project to the meetup to get some help with a power problem. We showed him how to set his multimeter to VDC and check the voltage across the solders on the On/Off switch. Power wasn’t getting past the switch. Either the solder was bad or the switch wasn’t working on the inside. Both Patrick and his very young daughter were eager to learn and they showed the patience and persistence to keep trying. I’m excited to see Patrick demonstrate the maker philosophy and pass it on to the next generation! Austin made this LED lamp, despite having two left hands! Other makers brought their finished and unfinished projects for show and tell. 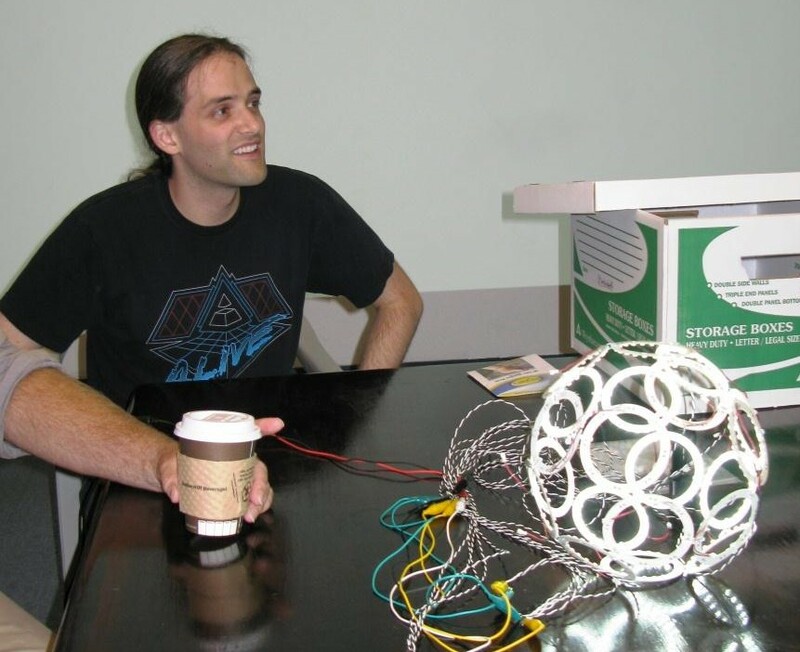 Austin Spafford brought UV light responsive beads that change from white to colors, Lego’s that he purchased in bulk from the mall, and a creative use of LEDs in a soccer-ball shaped lamp. Craig Zupke showed off his Useless Machine, which he crafted out of wood, a tiny gear motor and an analog circuit. I really need to make a Useless Machine for a Father’s Day gift next year! April Atwood brought an umbrella that she’s designing for a fashion show that uses an Arduino and blue LEDs inside the clear plastic for a dynamic display on a rainy Seattle night! If you’re attending SeaCompression on October 15th, 2011, then you might try making your own blinky umbrella or maybe a clear plastic raincoat with blinky LEDs! A blinky umbrella is a great example of making something functional and awesome while learning about circuits, programming, and working with adhesives. If you don’t want to program or solder, then you could purchase a string of battery operated LEDs and simply attach them inside your umbrella! Are you inspired? What are you going to make? This entry was posted in Lighting Project and tagged Bellevue, LED, maker space, Makers, Seattle, Student RND, umbrella, useless machine. Bookmark the permalink.